Are you looking for a BIRTHDAY or HOLIDAY Gift for children ages 2-10? A fun gift to enrich the lives of the children you love? A *star power reading program for homeschoolers, that stretches from tots to tweens, preschool, or afterschool programs? Keep reading to learn about a Books & Activities Combo that stretches for a year and find out how you can get your first book & set of activities for FREE! A package delivered to your door every month for a whole year. A companion email message from Stretch-e-Robot every month... with activities that stretch each book into a world of reading, singing, dancing, drawing, and acting... from readalongs and songs for tots… to Reader’s Theater scripts and video demos for Tweens to turn reading into acting. Build their teamwork skills with siblings and peers. Create family memories that will last a lifetime. "trick" kids into becoming fluent readers! Hello! 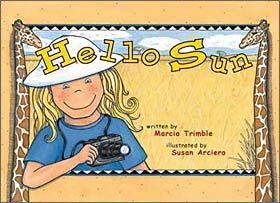 My name is Marcia Trimble. The #1 factor influencing a child’s educational success is an early introduction to books. The best way to get kids reading is to make it fun! 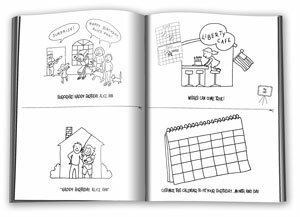 Over 10 years in the making, my Stretch-A-Book Club is a children's book of the month club that uses drawing, acting, singing and dancing activities to help kids ages 2-10 play their way to reading fluency. 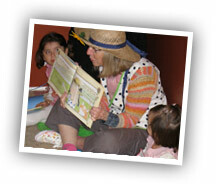 Ages 2-3 Toddlers enjoy listening to a parent, caregiver, or older sibling read the books to them. They enjoy the digital animations, dancing along to the songs, and doing the coloring and craft activities (with some help). 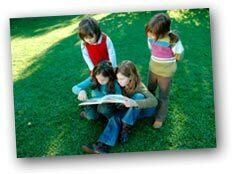 Ages 4-6 Pre-readers like to read along with the read-along audio track and tell the story they have heard. Pre-readers also enjoy listening to the songs, watching the digital animations, and doing the games and activities (with a little supervision). Ages 6-8 Independent Readers can read the books, listen to the music, and do the games and activities all by themselves. 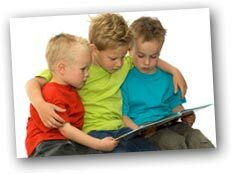 As they turn reading into acting they interact with others and build self esteem and communication skills. Ages 8-10 Advanced Readers can put on full productions of the books for their younger siblings or kids in the neighborhood! Performers start with a book and end with a bow or two. They learn that star power is participating, contributing, and connecting with others. It's Stretch-A-Book Club at a glance! * read * sing * act * dance. Then turn the wheel to Miss Muffin's space. « Listen to a message from Stretch-e! 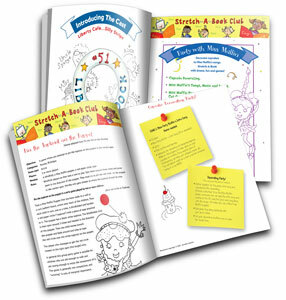 Stretch-A-Book brings books and fun eActivities to you for a year! A new book every month: Every month we send you a beautifully illustrated hardcover children's book in the mail. This is where the similarities between the Stretch-A-Book Club and your typical Children's Book of the Month Club end. Every month you will also receive an email from E-Robot containing links to download the eActivties that compliment that book. Lots of kids? Print lots of pages! Lose something? Print a new one! CD scratched? Burn another CD! get a FREE BOOK + WELCOME KIT! I am so confident that your 2-10 year-old will love the Stretch-A-Book Club that I am willing to give you the first book absolutely free! Liberty Cafe Is Open! 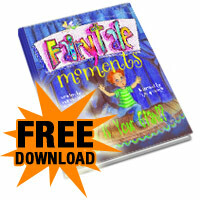 teaches young readers that when one door closes... another one opens! If your children like The House That Jack Built, then they'll get a kick out of Liberty Café Is Open! 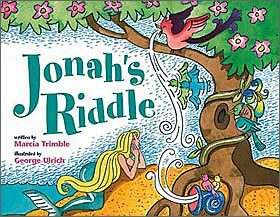 This 12 x 12-inch, 32-page paperback picture book for ages 4-8 centers on the endearing rhyme and repetition of classic jingles like The House that Jack Built or The Old Lady Who Swallowed a Fly. Each page builds on the previous page, until the lines are marching, flowing, and skipping across the illustrations . . . all building up as the characters in the Liberty Café wait for Alice Ann. This is a smaller version of the digital animation that club members have access to. The actual version is twice as big! If you enjoy Liberty Cafe is Open! and all the eActivities that go with it, don't do a thing. Another great book will arrive in your mailbox in a month, with corresponding eActivities being delivered via email by E-Robot. 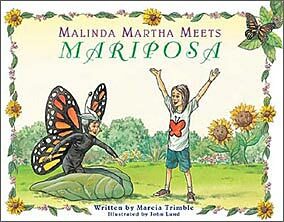 Malinda Martha imagines herself directing a backyard theater performance of the metamorphosis of a Monarch butterfly. Lots of games and activities! A tiny stone travels to niches on Nantucket Island until it meets the most important smile of all. 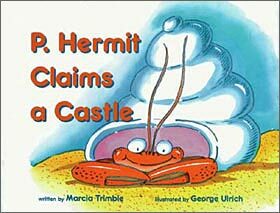 P. Hermit experiences two worlds, a world of fantasy outside his tidepool and the real world of his natural habitat, where he belongs. Children are sure to shout "Oolala!" for Peppy and Pepito! My 5-year-old daughter loved this story and can't wait to make the Peppy and Pepito shadow puppets included in the book. Peppy fun doesn't stop with the book. 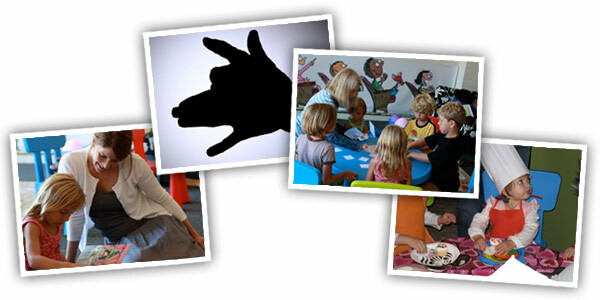 The website offers a variety of engaging activities. Children can download a wolf puppet pattern and four character masks--all in color. Continue the fun by downloading Peppy's song and lyrics, or play some of the suggested games. 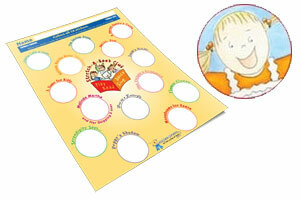 Older children can gather some friends, print the companion script, and put on a play! So much to do with just one book! Peppy learns that chasing and gnawing and chewing and barking and pulling can turn into positive talents—in the right place and at the right time. 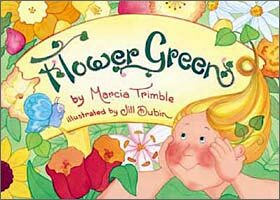 Flower Green celebrates the diversity of life in the magical garden of the Dancing Flowers. 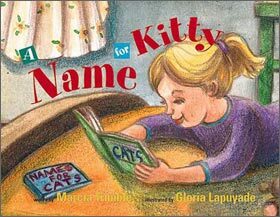 "Marcia Trimble captures the heart's desire of every child in her picture book A Name for Kitty. I recommend this heartwarming tale to children who adore their pets and to children, like my 5-year-old daughter, who still dream of one day being able to have their very own. " A Name For Kitty portrays a beloved experience of childhood as Malinda Martha takes a kitten home and finds him a name that fits. 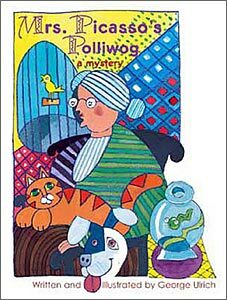 Mrs. Picasso's Polliwog is a fun and colorful adventure of discovery. Each two-page spread offers a page of text in solid, bright colors and Picasso-like illustrations on the opposite page. Mrs. Picasso solves the mystery of her missing polliwog with listening, and love, as Polly grows into her own unique sound. 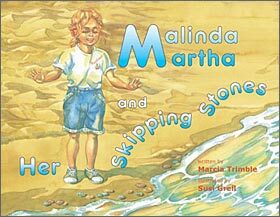 A pocketful of stones turns an ordinary day at the beach into an extraordinary day of self-discovery. 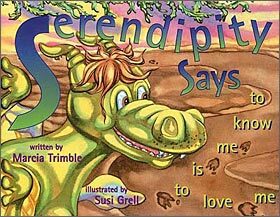 Complete with age-old sun, moon, and sea serpent, introduces children to the delightful concept of serendipity. Jonah enlightens a cowboy and a sailor about the magic that a storyteller and a listener create together. Hello Sun catches the images of four lion cubs through a camera's eye in the Ngorongoro Crater of Tanzania. If ever you decide to cancel your membership to our children's book of the month club we will stop sending you books and stop charging your credit card $19.95 a month. It's as easy as that. 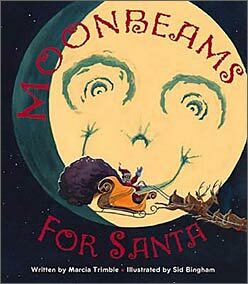 Gibbous's spirits are mighty low until he discovers his inner glow and reveres his part in lighting the way for a Santa on-the-go. Activity plan for the month. "What Makes Stretch A Book the Perfect Gift?" "Fun and Happy Father's Day"
"My daughter and husband created a fun and happy Father's Day morning with a wonderful shadow puppet play. We were thrilled with this fun, memorable and interactive family activity. 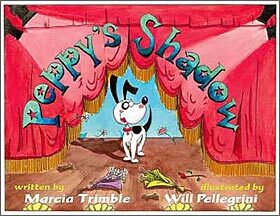 It is easy to do your own puppet show, too, with directions and puppets in the book (Peppy's Shadow) as well as the eActivities." "We have enjoyed listening to the books and CD's together and dancing with the music. Braden has so much fun with the books. He just read Peppy's Shadow and reminded me that we hadn't made the shadow puppets yet. He also loves the digital animation of Witchy's Turned Around House. 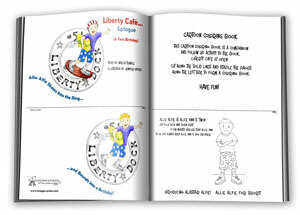 "Learning to Talk... and Read"
"Hunter loves Liberty Cafe Is Open! and asks me to read it with him multiple times a day. My husband and I have it memorized. He helps "read" by finishing each "And everyone is waiting for..." lines. He is learning to talk!" 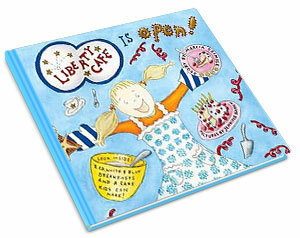 "We read Liberty Cafe Is Open! all the time. Hunter wanted to have a breakfast party for his birthday party this year because of Alice Ann, so we did, and he loved it!" 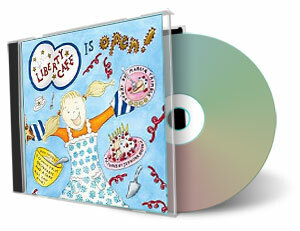 "Our daughter reads Liberty Cafe Is Open! with her grandma in the kitchen before baking. I have to say that a book party is a great educational way to celebrate your little one's birthday. 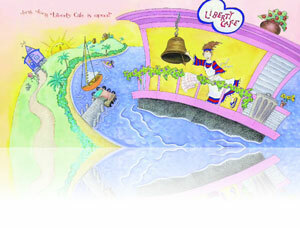 The books are very cute, with beautiful illustrations." 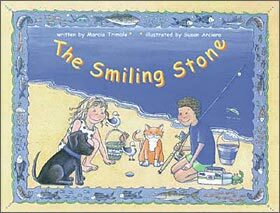 "My students enjoyed looking for the stone on each page of The Smiling Stone. We then went out and each child found a stone of their own. They all drew a special smile on their own "smiling stone" and left it sitting on their desk." 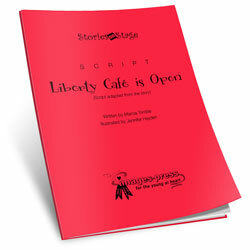 "Liberty Cafe Is Open! is a truly happy and delightful story to read. The children loved Alice Ann and related to her as if she were their friend. They loved getting a peek into what Alice Ann is doing (in the mini pictures) while everyone else in the story is wondering where she is. You could almost feel the love, anticipation, and concern everyone felt for Alice Ann. My students were eager to get their turn to read aloud and I sincerely appreciate a story with such a positive, family warm feeling." "These Books Have Brought Sweetness into Our Lives"
"When Victorya was younger she loved turning the pages when the little chimes came on, even though she couldn't read them yet. Now she reads the books to her little sister. Last night after I tucked the girls into bed and left a small light on in their room (I was babysitting for the night), I came back to check on them a while later and Vicki had Flower Green in her arms. She had been reading it to her sister and had fallen asleep. These books have brought sweetness into our lives over the years with singing and dancing and reading good stories. My other grandchildren are coming in August and we will be reading and dancing with them too." Stretch-A-Book can help you raise a smart, reflective and confident child that is ready for life. Being ready for real life. Ideas are the currency of the 21st century. The successful members of your child's generation will be the "idea people" who are able to communicate their cause and build a team around it. I am confident that Stretch-A-Book can help you give your child the skills they need to be a "thought leader" in the 21st century workforce. PS: Get your first book and Welcome Kit for free when you pay just $6.85 for shipping!. © Stretch-A-Book. All rights reserved.